Any extracurricular activity can be a big commitment for families. Youth sports is no exception. Often, parents find themselves juggling schedules to get kids to practices and games. 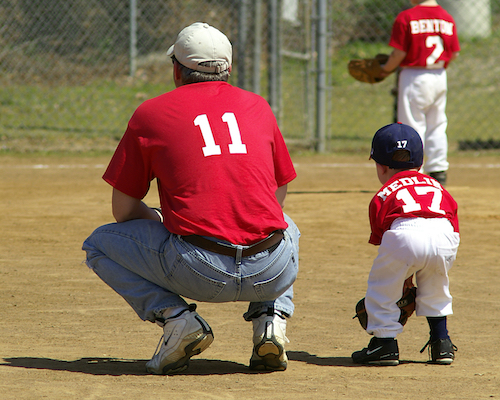 Even so, most families know there are many benefits of youth sports participation. And that makes them willing to accept any short-term challenges. In fact, a recent study found that 76 percent of parents encourage their kids to engage in middle and high-school sports. Most athletes who participate on these school-based teams got their start in youth sporting leagues. Clearly, most parents see value in youth sport programs. Here are five top reasons why you may want to sign your son or daughter up for an athletic team or activity. Today, young people face many temptations to lead a sedentary lifestyle. And far too many do fall into this trap. Technology use by kids is on the rise, while time spent outdoors is decreasing. Just one in three children participate in daily physical activity. How can you keep your children from lapsing into inactivity? Signing your children up for a youth sports program can help them develop good health habits. Even a one day per week of regular exercise can be beneficial. Kids who play sports have lower body fat, stronger muscles and bones, and increased cardiovascular fitness. They have a much lower risk of becoming overweight or obese. And they can create a foundation for a healthy lifestyle. Positive health outcomes are one of the major benefits of youth sports participation. For many kids, playing sports is a great way to make new friends. Participating on a team can give your children a chance to get to know others in their neighborhood, school, and local area. Often these friendships last even after the season ends. Kids can reflect on fun times spent together and shared interests. Also, playing in a local league helps build a stronger connection with the community. Young people will get to know adults who serve as volunteer coaches or league officials. They can build relationships with these trusted adults–who can be important role models. And your children can witness the value of volunteer service first-hand. They can understand what it means to be a positive community contributor. 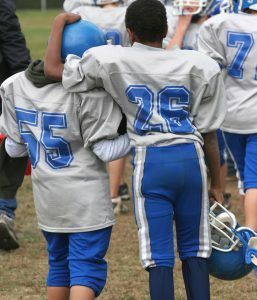 Does anything build friendships among kids better than sports participation? Many young people who pursue sports have a strong self-concept and are very goal driven. These positive qualities can carry over into the classroom. In fact, several studies have found a link between youth sports and academic success. One study found that a large percentage of athletes reported achieving an “A” average in school. Student athletes were far more likely to have strong educational and career goals as well. Most aspire to graduate from both a four-year college and a graduate or professional program. The benefits of youth sports participation extend beyond the field, court, or arena. Through playing sports, your children can learn to make quick decisions and work as a team. These positive qualities will serve them well in future careers. Sometimes, young athletes face the discomfort that comes from being in the spotlight or having teammates rely upon them. And the disappointment of at least one difficult loss is inevitable. Still, most young athletes know they have the full support of their coaches and families. They learn that they have the strength to face adversity. Tough experiences in sports can help young people build resilience that stays with them well into adulthood. For example, one father of a young athlete remembered feeling nervous about pitching for his youth baseball team. He also knew his family would appreciate his contribution no matter the outcome. As he’s grown to face far more complex situations–both in his personal and business life–he looked back on his early pitching days. Now, he recognizes how that experience taught him that he can weather any challenges. Character is built on the court, field, pitch, or gridiron. Participating in sports can help young people develop healthy habits that last a lifetime. Often, young children may experiment with several sports, but focus or one or a few when older. Those that continue with sports recognize that regular practice can help them gain new skills. And more intense training can bring higher levels of performance. This motivation for self-improvement often persists after organized sports participation ends. Researchers have found that young athletes grow up into active adults. In one long-term study, those who took part in sports between the ages of nine to 18 were five to six times more likely to be active into adulthood. In some case, participating in youth sports just once a week led to a much higher probability of being active adults. Without question, regular physical activity early in life can lead to a healthier future. Today, youth sports participation is a way of life for many families–and for good reason. Taking part in a sport requires regular exercise, which is key to good health. Young athletes can develop physical confidence and skill. And they can build strong relationships with teammates and coaches. This social support helps them feel connected to their communities–and fosters a sense of belonging. The benefits of participation in youth sports don’t end when the final buzzer sounds. Instead, young people often bring the discipline and motivation gained through sports to school. In adulthood, people can rely on the resilience gained from sports-related challenges to overcome any work and personal hurdles. Youth sports can require compromises and sacrifices. Still, parents can trust in the knowledge that their children are gaining immediate and long-term benefits. Those positive outcomes make all the miles and hours worthwhile. 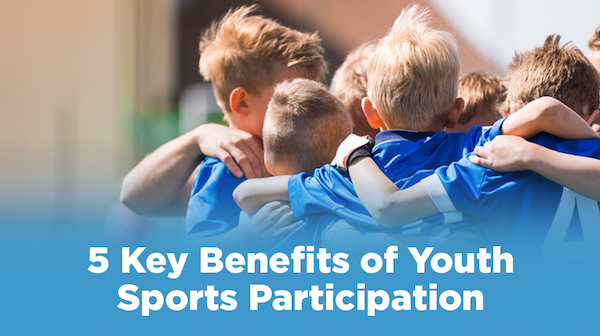 Other benefits of youth sports participation? Contact us at hello@jerseywatch.com. Jersey Watch is the easiest way to set up a website, register players, schedule events, and communicate with participants for your team, club, or league.